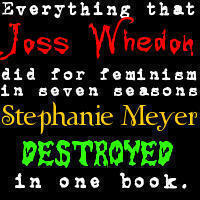 Stephanie Destroyed Joss's Work. I made this icon for Jighooligan101 a while back. Thought I'd share.. Images in the Critical Analysis of Twilight club tagged: twilight buffy the vampire slayer stephanie meyer joss whedon critical analysis of twilight cat. Robert gets PWNED sa pamamagitan ng Doctor Who!